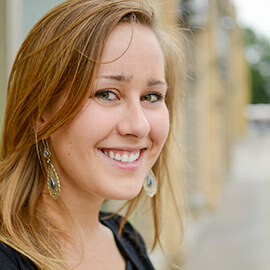 Laurier alumna Becca Vandekemp McLellan (BA/BEd ‘12) always knew she wanted to work with youth, and had her sights set on teaching in the primary grades. What she didn’t know was how drastically her studies and career path would change in the span of 60 minutes. After studying education for two years at Laurier’s Brantford campus, McLellan experienced a shift in her career aspirations. While she enjoyed the education components of her program, she discovered a deeper connection with subjects like social justice and community development. A classmate of McLellan’s suggested she consider courses that included a community service-learning (CSL) component, which fuse classroom content with real-world experience within a community setting or local organization. McLellan accompanied her classmate to her CSL placement at the Why Not Youth Centre (WNYC), a not-for-profit organization that provides outreach to homeless and at-risk youth in Brantford’s downtown core. That one-hour visit to WNYC changed the course of McLellan’s studies and her life. From that point on, McLellan incorporated courses with CSL components into her studies, broadening her skills and knowledge base for a career in poverty reduction and community development, aimed at increasing the effectiveness and breadth of services available to community members in need – especially youth. McLellan completed two service-learning placements at WNYC, where she quickly established herself as an integral part of the community organization’s team. She coordinated service-learning placements for students from Laurier and nearby colleges and led them through a training program in youth mentorship that she formalized for WNYC. McLellan says it’s not uncommon for many of WNYC’s youth to walk across the city just to see their favourite mentor at the centre. Like their mentors, street youth also experience difficulties with friendships, romantic relationships, family dynamics and other hurdles common during adolescence and early adulthood. Connecting with the mentors at the centre provides a safe space for peer conversation and healthy socialization. “Student mentors play a huge role in building self-esteem, developing conflict resolution skills and just having fun with our youth – something that can be difficult to come by when you live in chronic crisis,” said McLellan. Many of WNYC’s youth are homeless, have criminal involvement, emergent mental health issues and struggle with substance abuse. McLellan and her team work on the front lines to connect youth to the many resources in the city. McLellan recalls when a student mentor shared that one of their youth feared for his safety after being told he would be assaulted on his walk home. Based on this, McLellan arranged transportation for the youth, who made it home safely without incident. “The connection established in this mentor-youth relationship allowed us to keep a young person out of harm’s way,” said McLellan. McLellan has worked with hundreds of street youth and close to 200 student mentors from Laurier’s Brantford campus. Many of the Laurier students, like McLellan, who is now employed at WNYC, remain part of the organization long after their placements have finished.